In 1880, at the age of fifteen, Charlie Gaunt left his home in Bendigo and signed on as a drover with Nat Buchanan. Two years later he was a key man on one of Australia’s greatest cattle drives – the Durack family’s epic journey from Cooper’s Creek, Queensland – to the Kimberley. Drawing on Charlie’s largely unknown story, and filling in the gaps with fiction, the author has created a novel unique in Australian literature. An unprecedented adventure, and a passionate love story – Whistler's Bones is both a celebration of the good things in the settlement of Northern Australia – and a damning indictment of the bad. Camp Leichhardt: One man, a wild river, and a crime that must be stopped. They Even Paid Me: Raw reflections of a third generation Kimberley cattleman. 5.0 out of 5 starsBrilliant! Wrenching. Amazing. Greg Barron, I take my hat off to you. I thought this was brilliant. 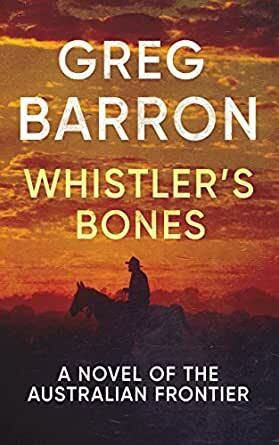 Whistler's Bones is a fascinating story based on the life of drover Charlie Gaunt who was one of the trial-blazing horsemen and drovers of the 1880s driving cattle across Australia into the Northern Territory to establish the vast pastoral stations of central and northern Australia. Boy, this is a wrenching tale. Through the eyes of Charlie, it is a no-holds barred view of 'white man' life and attitudes at the time. With more than 100 years of hindsight, the attitude of those drovers and cattle barons when it came to conquering the land as well as the native Australians - some of whom increasingly opposed them - but others who assisted them, makes for compelling and confronting reading. Charlie has all the flaws of a young man who feels immortal. What starts out as an innocence is stripped from him within years of his setting off for adventure on a horse called Constance, and Charlie does terrible things for his bosses, and out of loyalty to his colleagues, for love, and sometimes simply to survive in an unforgiving land, and his actions both shape, drive and haunt him the rest of his days. The bulk of the story narrates a two-year cattle drive across Australia with the Durack family, and recounts the many trials of the period - malaria for the men, sickness of cattle, loneliness, stampedes, starvation, drought, and as the drove moves into its second year, more and more increasingly hostile encounters between the 'invading' cattle, horses and stockmen and the various indigenous tribes of the Northern Territory and Queensland. Yet there is a love story at the centre of the tale too. The innocent Charlie who starts this story and for whom a great pleasure is to drink a glass of 'Creaming Soda' in a pub... is not the Charlie who becomes bitter and jealous, restless and resentful when the love of his life leaves him. I found Charlie's loss of this innocence terribly sad. Although of course, that's life. The descriptions of the Australian outback are breathtaking. I have travelled some of the north of the country in 1999, in a 4WD and on reasonable roads, not horseback. I've been to Lawn Hill Station and Borroloola, and I remember vividly the vast and ancient sense of the land. It was wonderful to revisit that space, colour, scent and memory of Australia in these pages. I don't know why I don't expand my reading with more early Australian history - I really do enjoy these factual stories entwined in fiction, and I might make it a goal to read more in this time period. Bravo, Greg Barron. Your writing is amazing. A unique perspective of early life in Australia, set in the harsh outback and detailing (with a fascinating blend of fact and fiction) an important part of history, based on the life of Charlie Gaunt, an accidental drover and trail-blazer in the 1880s. This tale is about driving cattle across Australia into the Northern Territory where the vast pastoral stations of central and northern Australia were established. Whistler's Bones is a sprawling frontier adventure that tells the story of an absolute nugget of Australian history, Charlie Gaunt. Gaunt's adventures take him through a number of significant events in Australian and world history - a veritable Forrest Gump of his times. The book is a great read, and I think one of the author's finest. The story of Gaunt, a real-life historical figure, represents a largely untapped vein although many of the people wrapped around that vein, including the Duracks and Nat Buchanan, are better known. As a young teen, Charlie Gaunt leaves his family and life in 1880s Bendigo to find what sort of life he can make for himself armed with little more than some potential as a horseman. Thus begins the story that takes him across Australia, and across the world. The strength of this novel for me, aside from the enthralling story telling, lay with the unfiltered retelling of Gaunt's story. Although an interesting and intriguing character, he is abundantly flawed. Some of his actions are indefensible and deplorable. In Gaunt, Whistler's Bones delivers a boy-to-man character we can at times admire, at times sympathise with and at times despise. The author's decision to focus primarily on Gaunt's early manhood, and retell the rest of his story in brief, underpins the fondest memories and greatest regrets that would stay with Gaunt for life. In resisting the temptation to lionise Gaunt and turn him into a champion of causes and rights that exist now but didn't then, Barron provides a near-as-possible to accurate rendering of the man and his times. And while I'm sure the author is uncomfortable with the terms used and attitudes towards aboriginal Australians at the time, they are present in the book in unvarnished detail because to modify them would be revisionism. Having grown up in Goulburn and being educated at St Pat's, the story of the Durack family and their epic cattle drive across to the Kimberleys was known to me, but I have to admit not in such detail or breadth. Whistler's Bones is a worthy addition to Australian literature and is deserving of being included in Australian school curricula where Gaunt's choices, the treatment of indigenous Australians and frontier life in Australian would provoke informative discussions and perhaps a desire to read more of this era and better understand it. This painstakingly researched book has certainly sent me in that direction. I've read a number of Greg's books, but enjoyed this the most. Barron is a fine author at the peak of his powers telling stories he is passionate about. Five stars. Sad but unfortunately truthful account of our past history. Taken from a true account but made easy to read and hard to put down. This book starts a little slow but then evolves into an very good read . I enjoyed it .